Creamy black bean soup was on the menu last night, creamy and very tasty. It was almost dinner time, but, I was in the mood for corn bread. Takes long to cook…hmmm…I will cook them in muffin molds to cut back on the cooking time, I thought to myself. A little bit of this and that, and these muffins were done in no time. I made only 6 (2 for the master, 2 for the dame, 2 for…er… the dame again for snacking), not wanting to have too many leftovers. I made 3 of ‘em with marinated feta, which added a sharp, but subtle punch to the muffins. We loved both versions. Preheat oven to 375F. Line 6 holes in a medium muffin pan with paper liner. In a larger bowl, mix the first four ingredients. In a separate bowl, whisk the next four ingredients until mixed well. Add the wet ingredients to the flour mixture. Mix gently until just combined. 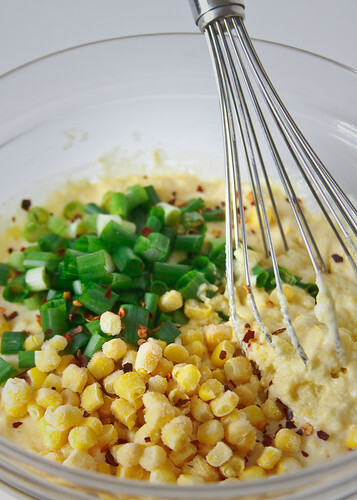 Finally, mix in corn, scallion or cilantro, red pepper flakes and feta (if using), to form a uniform mixture. Take care not to over mix. Pour into the prepared muffin molds, bake for 18-20 minutes until firm. Serve warm or at room temperature with soup or salad. Looks really pretty.. I had made one corn bread out of lunch emergency. The green onions is a lovely thing to add in this. I love cornbread, and this sounds like a great recipe! Wow that muffin looks gorgeous and delicous. I adore savoury muffins...you know what? I baked some with corn a few days ago too, and yes, it had yogurt too!! Great minds.....?? Lol! Those corn muffins look delicious Suganya.. 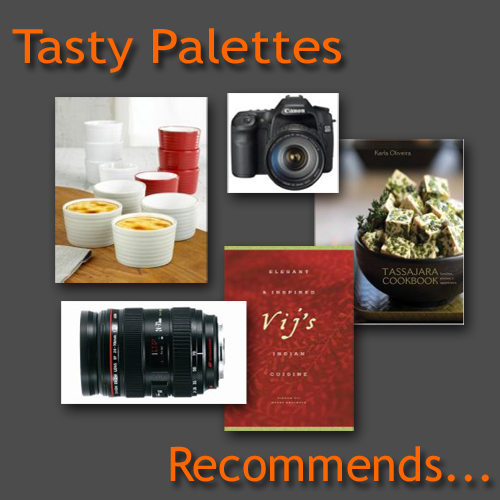 I bet they tasted wonderful with black bean soup. aaah, love corn muffins/bread. I end up making muffins too, they are more fun to eat, and easier too :D I use flax seeds instead of the egg though. Lovely cupcake liners! This is really tempting....Send me one here :) really want to taste it! Muffin looks perfect,love the texture. Those looks so tempting..love the combination of ingredients. Those wooden dishes are really cool. Love these cute little yellow sponges. And does the corn gets cookes during the baking time ? no need to pre-boil them? these muffins looks awesome, MUST TRY! but my only prob is I almost never have eggs at home, and 1 egg :( , can i sub anything else? Yet another stunning recipe. I just have to try this one too. Honestly, you should have a cookbook! I tried these muffins yesterday. I am sending it to T&T and MBP. Thanks for sharing the recipe. Also, i put your recipe on my blog. Please have a look at it and let me know if you want me to remove it or modify the post in anyway. I do have the links to your original recipe. Thanks again for the recipe..
i've never tried savory muffins. this looks sooo tempting. Picture perfect! Savoury muffins, my kind of muffins. Ilove the contrasts in your picture. I just have to wait to source my cornmeal from home when we go down next month! 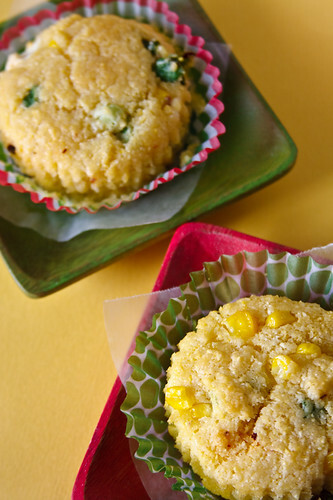 These corn muffins sound good! I baked these and I love the taste, I will bake these often. These didn't taste bad, but they didn't taste like cornbread which I think was due to using the whole wheat flour I used. I made chili and so they taste good crumbled in the chili, but I didn't particularly like them on their own.